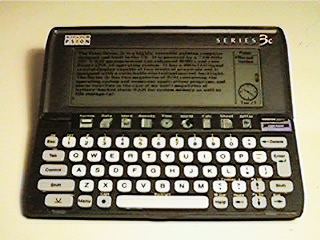 The Psion Series 3c is a highly versatile palmtop computer designed and built in the UK. It is powered by a 7.68 MHz NEC V30H microprocessor (an enhanced 80C86), and runs Psion's EPOC16 operating system. It has a 480x160 liquid crystal display capable of two levels of grayscale and is equipped with a switchable electroluminescent backlight. The Series 3c has two megabytes of ROM containing the operating system and numerous applications programs, and one or two (two in the case of my units) megabytes of battery-backed static RAM for system memory as well as file storage. The Series 3c is somewhat similar to the TRS-80 Model 100, only vastly more powerful and capable. Enthusiasts of that machine know that one of its great advantages over other systems is the fact that it can be turned off in the middle of an activity (editing a text file, for example), and that when it is turned on again, operation is resumed right where it left off. It is unnecessary to wait for the machine to boot its operating system upon powering it up. Many fans of that machine seem to be unaware that the same capability does, in fact, still exist in modern systems. I was most pleased to discover that the Psion range of palmtops is capable of exactly the same thing. One can even turn off a Psion in the middle of saving a file, with no loss of data. Upon being powered up again, it resumes exactly where it left off! This page will likely contain a great number of comparisons between the Psion and the Model 100. Prior to my discovery of just how excellent the Psion is, I believed that the efficiency and elegance of the Model 100 were things of the past. The further advantages of the Psion make it a truly exquisite computing platform. Inquiries are often made as to whether or not various features may be added to the Model 100. Some may be, by software patching or external hardware, but most are physically impossible without the machine being redesigned. The most notable of these features and capabilities are either already built into the Psion, or are possible with the addition of available software. Perhaps most notable are the ability to display 80x25 text, the backlit display, and ZMODEM file transfers, all of which exist 'out of the box'. VT100 emulation, a TCP/IP stack, etc. are available. The Series 3c has numerous other capabilities as well, most of which are impossible to implement on the Model 100. For one thing, one or two megabytes of memory makes for considerably greater versatility than somewhere between 8 and 72 kilobytes, depending on the particular machine in that series. The Psion also has 8-bit (12 bits compressed to 8 with A-Law compression) audio capability with a built-in speaker and condenser microphone. The OS includes facilities to generate all 16 standard DTMF tones through the machine's speaker. Also included are RS-232C serial and IrDA-compliant infrared interfaces, each capable of operating at up to 57.6 Kbps. The Series 3c can print to either the serial or infrared port. - World application which shows distances to various cities, local times there, etc. Additionally, as the Psion is a multitasking machine, it allows numerous applications to be open simultaneously. One may switch between open applications with the touch of a key. The Psion has a button bar located between its display and keyboard which allows one-touch access to various applications. One area in which the Model 100 excels is that of battery life. A Model 100 will operate for up to 20 hours from four 'AA' cells. Well, the Series 3c has it beat again, by no less than eight times. The 3c will operate for up to 80 hours from only two 'AA' cells! I have already achieved greater than 40 hours of operation from a single set of alkaline cells, including heavy use of the relatively power-hungry EL backlight and audio output. The 3c includes a usage monitor function which displays the actual total operating time for the two most recent sets of batteries. On the subject of batteries, the Psion uses a replaceable lithium button cell for its memory backup power. This is superior to the Model 100's NiCd backup battery, which is soldered in place. Psion virtually pioneered the field of handheld electronic organisers, hence the strengths in that area exhibited by their more recent machines. Their EPOC operating system was designed not from the standpoint of a desktop OS being shrunken down into a handheld device (like Microsoft's bloated, inefficient, unstable, clunky attempt at entering the handheld market, Windows CE), but from the standpoint of a mission-critical embedded system. The more recent EPOC32 incarnation is used widely in embedded applications, as well as the Series 5 and Series 7 computers. I know of an earlier Series 3 model which has not been reset in over six years...that is what I call stability. :) The Psion machines are unbeatable merely as organisers, yet they also excel as full-featured computers. They additionally exhibit superior physical construction, resulting in very reliable systems all the way round. Here's a tip for other Psion users (the concept of which is also valid for various other systems): I created a new directory called \BAK\ where I keep backups of my most important files from the various applications (agenda file, phone number/address database, important word files, etc.). That way, if a file happens to be improperly edited or accidentally deleted, I can just copy the backup file back into the application's directory. This also facilitates rapid backups of all important files to another machine, simply by dumping that one directory. The Psion is so efficient that a large amount of information only occupies a few tens of kilobytes in that directory. Visit the official pages of Psion and Psion USA. Check out the Psion software archives of 3lib, Tucows, and SunSITE Northern Europe. Many questions are answered by the Psion Series 3x and Series 5 FAQs. There is some useful Psion Series 3 information available on 3 for all. Palmtop Magazine is devoted entirely to Psion machines. Authored on a Psion Series 3c!